"Going to Derby College for my A levels is 100 per cent the reason why I’m now a qualified vet doing a job I absolutely love." Veterinary surgeon Dr Shareen Akhtar is convinced that Derby College is 100 per cent the reason she is now in a job she absolutely loves. Shareen, who is 27 and grew up in Mackworth, took her A levels at the College’s Joseph Wright Centre. However, despite being a bright student, outside work pressures meant she didn’t get the grades she needed for veterinary school the first time round. 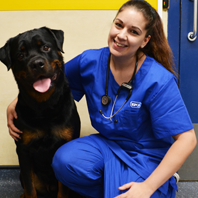 Shareen wanted to be a vet because of her Rottweiler Kiza. She was poorly bred by a back yard breeder and had lots of health issues as a result. Shareen felt helpless not having the knowledge or skill set to help her, and that’s where her path to becoming a vet started. Shareen said: “Going to Derby College for my A levels is 100 per cent the reason why I’m now a qualified vet doing a job I absolutely love. Once she had the required A level grades, Shareen got offers from two veterinary schools and accepted a place at Nottingham Vet School. She now works as a vet at the RSPCA Greater Manchester Hospital. As the first person in her family to go on to further education, she wanted to make the most of College life. “I now live in Manchester with my four year old male Rottweiler Riken (pictured) who is my best friend.